On our final morning in Paris, Dan and I checked out of our charming Airbnb apartment and took the Metro to the Musée de l'Orangerie to see arguably Monet's greatest work "The Water Lilies." This museum is right around the corner from the Louvre and the Tuileries Gardens. We arrived early (maybe 10:00 AM) and found we were able to walk right in and check our backpacks in the luggage storage. Amazed, we turned to each other and said "Maybe this museum just isn't that popular." However, when we left, the line wrapped all the way around the building! So definitely be sure to check the museum's website for the best time to visit to avoid lines, as we just got lucky! Also, unfortunately, due to the recent issue with terrorism in Paris, the museum has a notice on the website stating that they will no longer store your luggage. Feel free to call ahead and double check before you go, as this was a great convenience for us. The museum is named for its previous purpose, housing the Tuileries Garden's orange trees during the winter time. The structure is actually built like a greenhouse to maximize sunlight exposure from above and minimize the impact of the northern winds. After World War I, the building was repurposed to house the works of living artists. At this time, it was suggested that Monet's Water Lilies be displayed here. Monet worked closely with the architect on how these eight displays, 2 meters high and over 91 meters long each, would be installed in two oval rooms, forming an infinity loop. Today, Monet's Water Lilies were mounted to follow the path of the sun such that versions with sunrise hues are on the eastern side and those with sunset hues on the western side. The natural light from above is also intended to allow the viewer to see the paintings in a different light depending on the weather. I honestly can not say enough about this incredible piece of history. Monet spent three decades working on this, and died before the final installation. His upmost desire was to provide an escape from reality, to offer beauty to those burdened by war. I could spend all day here. In fact, I did notice a few students sitting with notebooks and headphones, clearly working on some homework. Below the oval installation is a larger exhibit dedicated to more impressionist and post-impressionist pieces. On our way out of the museum, we stepped to the side to look at our map to determine which Metro line we needed to be on to get to Orly Airport. At this time, a lady surprised us picking something up by our feet and and asking if this, clearly cheap and not gold, "gold ring" was ours. We politely said "No" and turned away. She then turned back towards us insisted we have it since it was such a nice ring. We tried to be polite, but she started getting pushy. At some point, she insisted that since she had found our ring, we should pay her money. At this point we understood the scam, and became less polite with our "Non" and she finally went away. A kind lady in line quickly ran over to us warning us to check for our phones and wallets because that was a gypsy and they are known for pick pocketing you. Luckily we had these items safely stowed away. A few minutes later a man and a young boy approached us with the same trick. This time, I not only recognized the scam, but I recognized him! I had seen him in the gardens when we arrived with the first gypsy women who had approached us. Before the man could finish his spiel about the ring, I quickly held up my hand and shouted "Non, non, non! Au Revoir!" My own early version of "Bye, Felicia!" He started laughing, held up his hands in surrender, and mocked me "Oh! Non, non, non!" and walked away defeated. With a better sense of direction, we spent our remaining time in Paris walking around the Tuileries Gardens, taking pictures in front of the Louvre's Pyramid, and waving to the tower with a heartfelt "À bientôt, Eiffel!" On the train to Orly, a refugee boarded the train and made an announcement in French about his family's struggle. I was amazed when almost every passenger on the train dug in their pockets and purses for spare change. In France, I would not have been surprised to be treated rudely. However, I have to say that the French are an absolutely lovely people who have always treated me with kindness and patience, and amazed me with their generosity towards me and towards their community. 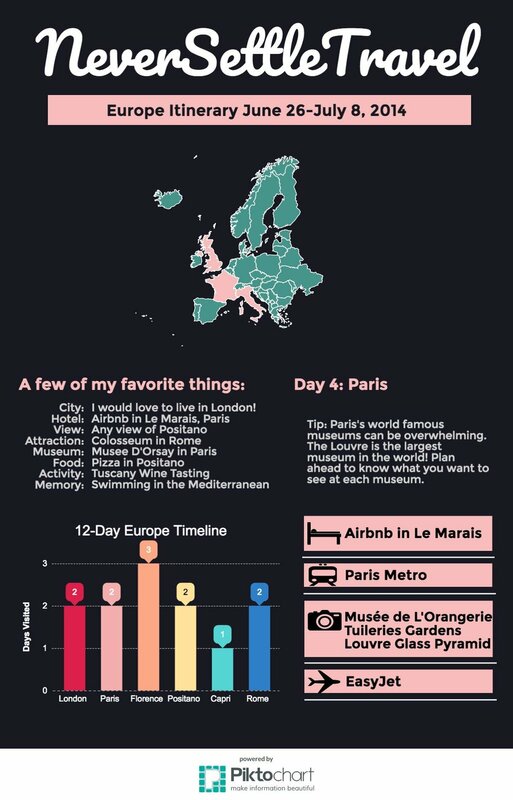 If Paris is on your bucket list, I hope you take the first opportunity to visit! Have you been to Paris, before? Comment below, we want to hear all about your trip!